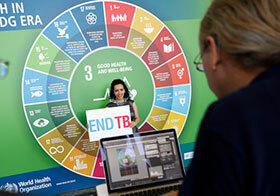 As part of an event to promote the Global Ministerial Conference in Moscow on ending tuberculosis, visitors posed with an "ENDTB" sign. Delegates at the World Health Assembly approved the Organization’s proposed programme budget of US$4421.5 million for the biennium 2018-2019. This proposed budget sets out the Organization’s priorities in line with the Sustainable Development Goals. It includes increased investments in the new WHO Health Emergencies Programme and combatting antimicrobial resistance. Congratulating Dr Tedros Adhanom Ghebreyesus on his appointment as Director-General, the delegate of Monaco underlined the importance of reaffirming WHO’s role in world health and other areas. Monaco also emphasized the need to strengthen fragile health systems and facilitate access to services for all, and made reference to the WHO Small Countries Initiative. At the Initiative’s most recent meeting held in Monaco, countries agreed on a joint statement: The Monaco Statement. Health in all policies – Health in all SDGs: call for action on climate change. Israel noted that the adoption of the 2030 Sustainable Development Agenda has put health at the forefront of the development agenda, and shows the importance of health to economies. The delegate also described Israel’s active role in providing medical support during humanitarian emergencies, including the conflict in Syria. Dr Zsuzsanna Jakab, WHO Regional Director for Europe, also received thanks for her “sincere cooperation and assistance” to Israel. During a plenary intervention, the delegate of Belarus identified stable health sector financing as a requisite of a good health system. Despite the challenges of addressing noncommunicable diseases, the delegate explained that Belarus was working hard to ensure equal access to health care for all. The issue of strong health systems was also raised by Greece, underlining that prioritizing public health care is not enough, as broader intersectoral interventions are required to address the social determinants of health. The delegate made reference to the Valetta Declaration, recently signed by 6 European Union countries from the south, with the aim of improving access to medicines. Mr Yelzhan Birtanov, Minister of Health of Kazakhstan, explained that the well-being of the population, including vulnerable groups, receives the highest political backing in Kazakhstan. The minister also invited delegates to take part in the international conference on the occasion of the 40th anniversary of the Almaty Declaration in November 2018. He explained that it would provide an opportunity to discuss the role of information and communication technologies in primary health care. The delegate of Denmark emphasized that the SDG goal of good health for all requires rethinking health into old age, and noted that governments have a responsibility to talk to the elderly and enable them to retain freedom of choice. Denmark welcomed the action plan on dementia and underlined that addressing NCDs remains key. During a plenary address, the delegate of Georgia outlined how the country has been extending public health services to include over 90% of the population, expanding the list of essential medicines to reduce out-of-pocket payments, and enlarging the benefit packages for major NCDs including diabetes and cancer. Georgia has also introduced the world’s first hepatitis C elimination programme. Uzbekistan also described recent developments in the country, including the establishment of rural clinics, a centre for emergency services, and specialized clinics. The government is committed to achieving the SDGs, and recognizes the need to improve data collection in order to inform policy decisions and speed up implementation. An intersectoral working group has also been established to tackle antimicrobial resistance. The Republic of Moldova has established a national council for SDGs and is committed to monitoring and implementing the indicators and targets. Specific successes outlined by the delegate included the establishment of a new agency on medicines that has helped to ensure a sustainable supply at lower cost, antiviral therapy for hepatitis C, a reduction in asthma admissions thanks to a smoking ban, and the elimination of mother-to-child transmission of syphilis and HIV. Speaking on behalf of the South-Eastern Europe Health Network (SEEHN), the Republic of Moldova noted that the network has celebrated its 15th anniversary this year and its members have pledged to implement the SDGs and share their experiences. The delegate also thanked Dr Zsuzsanna Jakab for her support. The delegate of Andorra explained how the “Healthy Way of Human Rights” initiative -- a 30km pathway connecting two border points in the north and south of the country – combines both the promotion of human rights and health and Andorra’s cultural heritage. Along the path every kilometre is marked by a commemorative plaque of each of the 30 articles of the Universal Declaration of Human Rights, so the route also provides a platform for sharing these universal values. Andorra invited other Member States to experience the initiative and join forces to promote a global network of healthy paths for human rights during 2018 and to commemorate the 70th anniversary of the Universal Declaration of Human Rights. Many Member States from the European Region made interventions during discussions in Committee A on the current programme budget, as well as the budget for the next biennium. Common concerns expressed included the current budget gap, the problem of underfunding for noncommunicable disease-related activities, and for emergency work. Countries also noted that the WHO web portal showing programme budget implementation by output was an example of best practice in the UN and thanked WHO for the increased transparency and accountability, which strengthens trust in the Organization. Several speakers explained that they would like to see further developments to the web portal, so that outputs can be linked to outcomes and results. Many European Member States made interventions during Committee A discussions on addressing antimicrobial resistance (AMR). Speaking on behalf of European Union and other European Member States, Malta expressed its satisfaction with WHO leadership in the implementation of the global plan on AMR and noted that the establishment of the ad hoc inter-agency coordination group (IACG) on antimicrobial resistance is a positive development. Many Member States expressed the need to move towards a One Health approach and engage all relevant UN agencies and welcomed the joint WHO, World Organisation for Animal Health, and Food and Agriculture Organization roadmap. Delegates also outlined national plans to address AMR and there were widespread calls for the few remaining countries yet to develop national plans to make them a priority. A side event co-organized by the Russian Federation was held to facilitate discussions on innovations in BRICS countries to support people-centred health care and identify opportunities for better implementation. At a side event held on Monday, about achieving results and sustaining progress related to the International Health Regulations (IHR) (2005), and the impact of the global Health security agenda, Finland described its experience of a Joint External Evaluation in March 2017. The delegate underlined the importance of engaging all stakeholders, including civil society and other sectors, as well as the cabinet of ministers and the President, and explained that they were now working on defining future strategic priorities and targets. Discussions between Dr Ruxanda Glavan, Minister of Health of the Republic of Moldova and Dr Zsuzsanna Jakab, covered changes in the government’s structure – the ministries of health, labour, social reform and family will soon be merged as part of efforts to speed reforms. The minister also described recent successes in increasing access to antivirals and fighting viral hepatitis. The Regional Director thanked the minister for hosting a visit by Her Royal Highness The Crown Princess of Denmark, WHO/Europe’s patron, in November last year, as well as the recent fourth South-eastern Europe Health Ministerial Forum held in Chisinau. She also offered support on primary health care reform. A meeting between Professor Talantbek Batyraliev, Minister of Health of Kyrgyzstan, and Dr Zsuzsanna Jakab included discussions about WHO/Europe providing support and guidance in the areas of: alignment with the Sustainable Development Goals (SDGs), new sources of financing, cross-sectoral road safety projects, and e-health. The minister emphasized the need to work more closely with parliamentarians and non-governmental organizations on health issues related to clean water and developing national strategies. The Regional Director thanked the minister for agreeing to be a member of the General Committee and she offered WHO support for health impact assessments in the country, as well as health promotion across different areas, such as healthy cities and health promoting schools. Additionally, she offered WHO’s assistance with tobacco control legislation, which the minister welcomed. Dr Claudia Stein, Director of the Division of Information, Evidence, Research and Innovation at WHO/Europe, also took part in the meeting and suggested that an upcoming mission to the country in July on maternal mortality reporting be extended to also address e-health assessment and recommendations.